Nearly 300 porcelain works, excavated from the Maojiawan site in the heart of Beijing, are being exhibited at the Beijing Art Museum. Four years ago, about one million shards, some of which may be up to 800 years old, were unearthed from an enormous pit in the capital's Xicheng district. Most pieces in the pit were made during the early and middle period of the Ming Dynasty (1368-1644) and some go back as far as the Yuan Dynasty (1271-1368). The discovery of the pit provided important information on the history of Beijing. 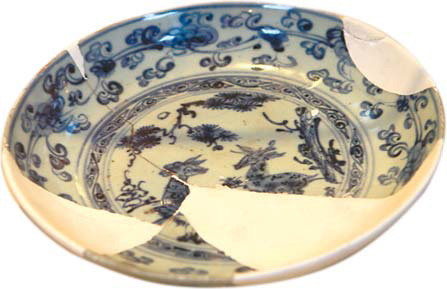 The vessels represented by these shards come primarily from the kilns of such porcelain producing towns as Jingdezhen, Cizhou, Longquan and Juntai. The exhibition has most of the incomplete vessels that have been restored and, from the traces left on the surfaces, it is clear that they were vessels for daily use. Most were the products of private workshops, while only a few were produced by the official kilns. Beijing Art Museum is located in Wanshou Temple (the Temple of Longevity) in Haidian district. Wanshou Temple, which was originally built in the Tang Dynasty (AD 618-907), was renovated in 1577 under the reign of Emperor Wanli of the Ming Dynasty, and houses Buddhist scriptures. It gradually became a temporary imperial dwelling and a place for royal birthday celebrations during the Ming and Qing dynasties.